Starbucks launched a well-meaning unity initiative on Tuesday. Cue the outrage. Get a life and "grow the cup up." That’s how many PR and marketing pros feel about the negative social media reaction to Starbucks’ pre-election "unity" cups. The green cups made their debut on Tuesday, featuring a mosaic of more than a hundred people drawn in one continuous stroke by artist Shogo Ota. "The green cup and the design represent the connections Starbucks has as a community with its partners (employees) and customers," Starbucks chairman and CEO Howard Schultz said in a blog post. "During a divisive time in our country, Starbucks wanted to create a symbol of unity as a reminder of our shared values, and the need to be good to each other." Some customers threatened on social media to boycott the chain, accusing it of over-the-top political correctness. 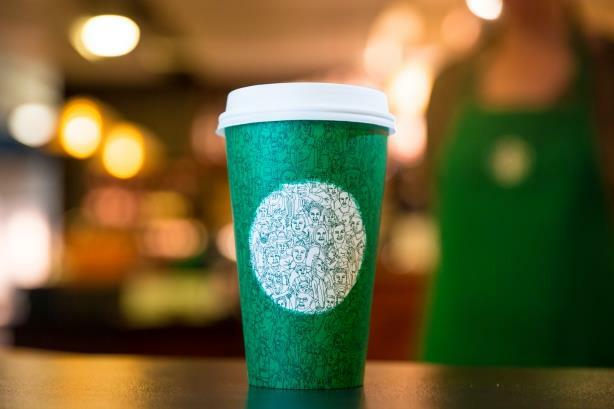 Others were angry because the cups are green and do not include Christmas imagery after several false media reports said they were part of the coffee chain’s holiday push. Last year, Starbucks found itself under fire from religious groups after it revealed red holiday cups without Christmas images. Republican presidential candidate Donald Trump even weighed in on the matter at the time. Several communications pros said on Twitter that the cups were nothing to make a fuss about. Here’s a sampling of what they had to say. @coreydu love the new unity cup! @coreydu Oooooo! love the design!